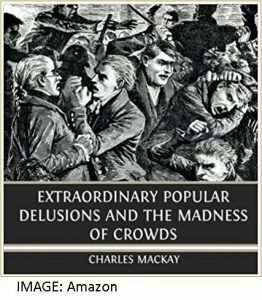 If Charles Mackay, the canny Scottish author of Extraordinary Popular Delusions and the Madness of Crowds (1841), were alive today he’d probably rename his book Group Think, Herd Mentality – maybe even Mob Rule – to gin up his SEO results. 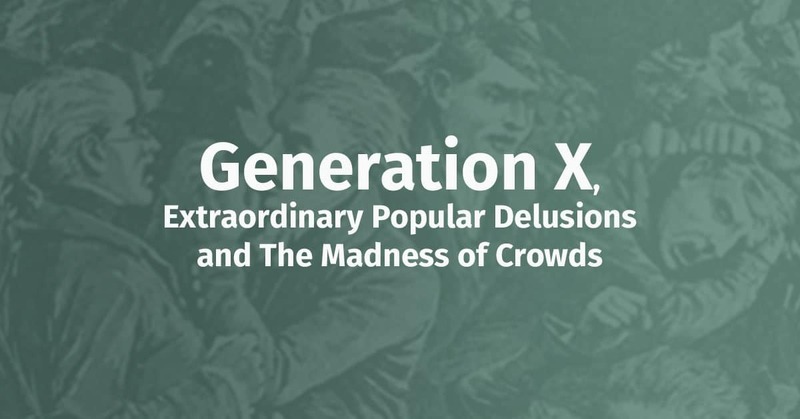 But madness of crowds is right on the money when it comes to describing how mainstream Madison Avenue approaches generational marketing, in general, and Gen X, in particular. Every year since 2015, some four million peak earning Gen Xers have left the 18-49 demographic, replaced by roughly the same number of 18-year-olds. Hey, no worries, they’re – you know – the future of the brand. Of course, these struggling newbies, minimum wage ingénues and starving students have ridiculously low buying power, but, dude, they’re uber-cool. Who cares about sales when you can have cool instead? 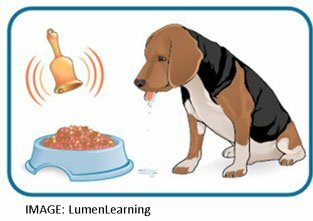 Meanwhile, the exiled Gen X oldsters join their siblings, the Baby Boomers, in marketing limbo, visualized as locked into predictable patterns of behavior, like Pavlov’s dog. Ironically, Pavlovian conditioning is far more evident in adland’s drooling devotion to the orthodoxy that consumers over fifty are no longer worth more than token targeting. Data from the Bureau of Labor Statistics (BLS) shows just how much madness is being lapped up by the marketing faithful. 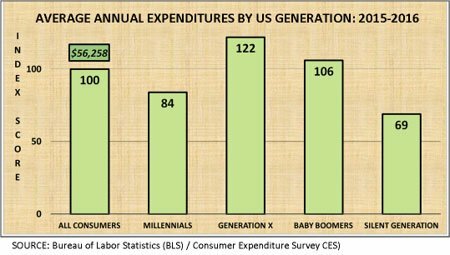 According to the annual BLS Consumer Expenditure Survey, per capita spending by Generation X (born 1965-1981) and Boomers (Born 1946-1964) is far ahead of that of the Millennials (born 1982-2000). Versus the 2016 all-consumer average of $56,258 (index = 100), Millennials check in at only $47,250 (index 84) versus $59,600 for Boomers (index 106) and a whopping $68,600 for Gen X (index = 122). Somewhere in time, Charles Mackay is yukking it up over adland’s gullibility – it beats the Dutch Tulip Mania hands down. Of course, popular delusions – tulips to Beanie Babies to 18-49 myopia – need a backstory. Not a rational one, mind you, just enough to nurture the seeds of group-think. In the case of the 50+ space, the cobwebbed mythology arose in the distant Mad Men days when the air was thick with Chesterfield smoke and the secretarial pool was fueled by IBM Selectrics and correction fluid. Fact check: many research studies have shown the 50+ audience is constantly changing, adapting and evolving. The latest evidence comes from a 2017 Boomer / neXt survey of 510 US adults aged 50-71. The researchers found the vast majority (86%) enjoy learning about and trying new brands and over two-thirds (70%) are always on the lookout for new brands to try. To be fair, a few savvy decision-makers – just a trickle – are slowly figuring out those popular 18-49 delusions are driving away opportunity and that things will only get worse in the years ahead. For starters, they have discovered the adult 50-plus population is growing faster than the 18-49 cohort (US Census Bureau): those pesky Boomers and Gen Xers are going to be around for a long time. – As 2018 began, over 12 million Gen Xers born 1965-67 had disappeared from direct targeting. – By 2020 over 20 million will be gone. 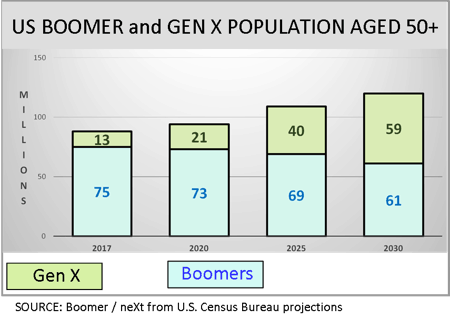 – By 2030 there will be 120 million Boomers and Gen X aged 50+, a gain of 54% over 78 million in 2017. 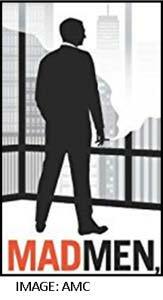 Visionaries are also sensing a more obvious penalty awaiting brands that marginalize the 50+ space: Gen X is rapidly ascending to top management positions in C Suites nationwide. Good luck convincing these hard-charging new bosses to ignore the world’s 3rd largest economy. Good luck convincing them consumers over 50 are easy to engage – after a lifetime of brand promises, experiences and touchpoints, they are assuredly not easy. Even more challenging, good luck convincing the new 52-year-old VP of marketing she is too old to adapt, too old to accept new products/ideas and too old to be included in her own advertising campaigns! 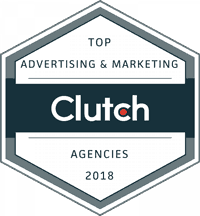 How fast can you say Agency Review? The Washington Post has already written the ominous narrative: We thought Gen X was a bunch of slackers. Now they’re the suits (March 1, 2017). Oh well, all bubbles burst eventually. 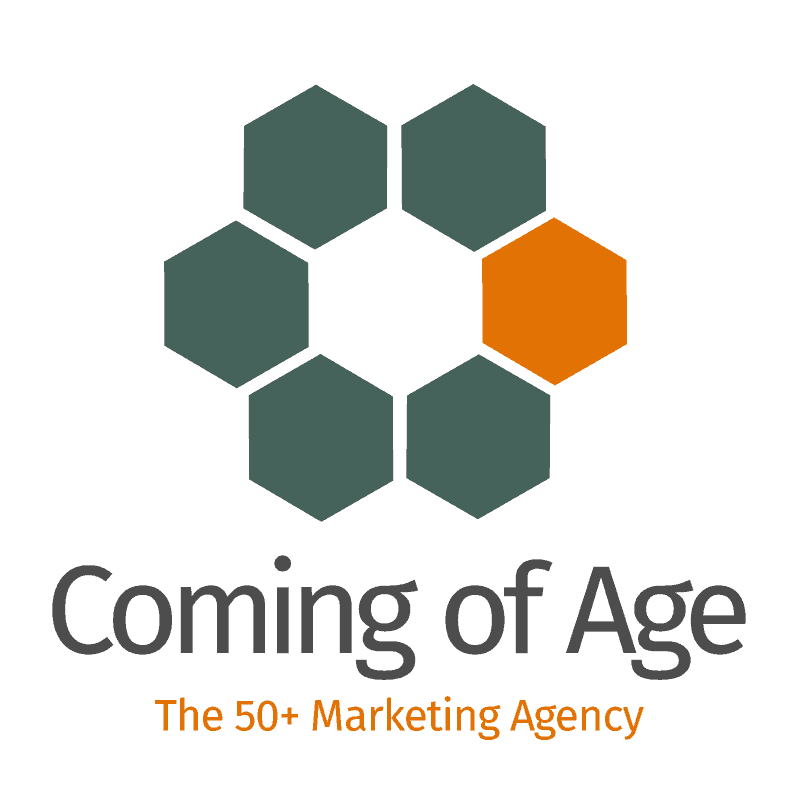 As brand strategists awaken from the bursting madness of crowds bubble there will be client-driven urgency to understand the vibrant 50+ demo. Wow! Everything brands need to know at the push of a button, the stroke of a key. Maybe a couple of quick online focus groups, probing Xers and Boomers about what it’s like to be really old. 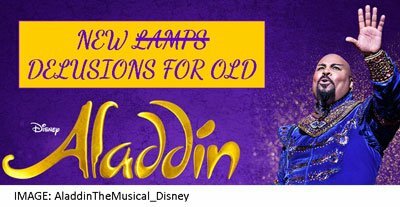 Oops, a senior … er, a grandma … um in the golden, silver, twilight years. Disclaimer: we’re not denying the value of 21st century technology or snubbing the incredibly creative young talent that gives advertising its drive and dynamism. And we recognize that mythology about marketing beyond the 18-49 cohort is something we Boomers forced on the Millennials, not vice versa. The real point is – talent or not – brands cannot simply Big Data their way to success among the 110+ million consumers who represent two-thirds of America’s homeowners and own 80% of the nation’s personal assets. Success requires expert guides to navigate the chasm between conventional wisdom and the reality of consumers who live – and buy – in the 50+ space. It’s what we do. We understand how they think – and we help brands connect with them. Thank you for this! It was a sad day when I realized that I had “aged out” of marketing. It was also surprising since I had more disposable income than ever, with childcare, higher education and weddings behind me.